Surgery gave the beautiful beastie the chance to run as fast as the wind. Cheetah Ambassador Ruuxa is on the move, post-surgery, at Shiley's Cheetah Run at the San Diego Zoo Safari Park. HOW FAST CAN YOUR HEAD SWIVEL? It's an easy thing to try and find out, as you sit before your computer (just be careful, head-swivelers, as you don't want to pull anything). We can generally glance from left to right, or vice versa, pretty quickly, depending upon what we're watching. But a person truly discovers what their head-swivel speed is when they're sitting at Shiley's Cheetah Run at San Diego Zoo Safari Park. That's the loooong stretch where the preserve's cheetahs have been known to stretch a leg at very, very high speeds. How long is the run? It's 330 feet, and since a cheetah can top out around 70 mph, that means, yes, that they can best the distance in about four seconds. But a young Cheetah Ambassador at the park named Ruuxa faced a much bigger challenge, beyond completing the run in the blink of an eye. RUUXA'S ROAD: Born with "a growth abnormality in his forelegs," a feature which caused bowing, Ruuxa faced many mobility challenges from the outset. You may have heard about his story, in large part because of his constant canine friend Raina (Ruuxa and Raina have become a popular duo via various online videos and snapshots). But here's the next development in the cat's tale: When Ruuxa hit his four-month-old mark, in September 2014, he underwent surgery at the Harter Veterinary Medical Center, which is located in Safari Park. The great news? His recovery was "remarkable," so much so he is newly running at Shiley's Cheetah Run. WANT TO SEE RUUXA? Cheetahs are out doing their lickety-split thing each day at the park at 3:30 in the afternoon. You might see the young cheetah, or another of the cats who call the park home, but whichever cheetah you see, just be prepared to do that lightening-quick head swivel. 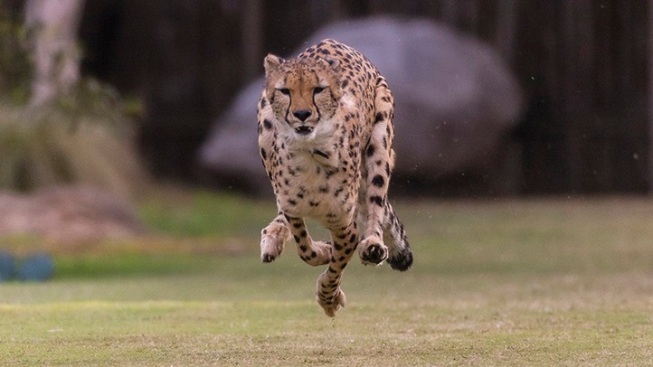 Cheetahs are, after all, "the fastest land mammal," and that young Ruuxa can now display his prowess here is an inspiration. Surely an inspiraiton to Raina, too, his sweet pal who remained close to her cheetah friend throughout his recovery. They're so close-knit, and awww-dorable, that it's no wonder these two sweeties are some of the darlings of the internet. Want to admire them in person? Run this way.